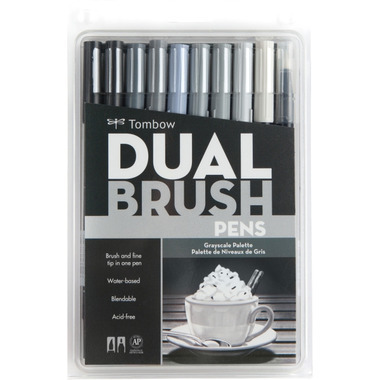 Tombow Primary Palette Dual Brush Pen Set features a dual-sided design to provide both a flexible brush tip and fine tip in one marker. The brush tip works like a paintbrush to create fine, medium or bold strokes abd the fine tip lets you create precise, consistent lines. Water-based ink is blendable, acid-free, nonbleeding and odorless. These pens are perfect for use by artists, crafters and more.